I have worked in the animal field over 10 years. Starting in the field as a farm hand to vet tech to dog trainer. I’ve always found happiness when with the animals. It wasn’t until I had my first puppy of my own that I found my true passion in dog training. It wasn’t too long after Ox came into my life that I discovered that she was deaf. Training now presented a challenge for me. I knew training was even more important since training was going to be able to keep her safe and happy. During this time in my life I was recently hired at Petco. I had seen some training classes and decided this was a good place to start for both of us. The more I was teaching her the more I decided this was an area I felt I could help others and I started teaching the classes. 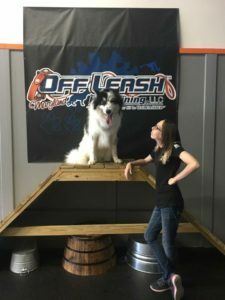 As I learned more and gained more experience I felt there was still more to learn and more ways to help clients with their dogs. 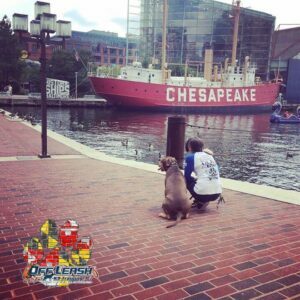 I had reached out to Off Leash K9 Training, Maryland for an opportunity to work with them and gain more experience and methods of training. 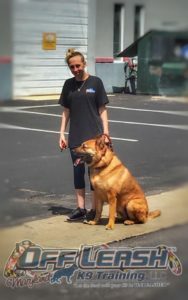 Since being w ith Off Leash K9 Training, Maryland I have the opportunity to work with dogs of many different behaviors such as aggression, anxiety, reactivity and all of been from vast differences of age, breed and size. I’m a Canine Good Citizen Evaluator, I have trained dogs for Therapy Dog Programs, Service Dogs, and ESA. Learning about dogs and their behaviors is always being learned. I’ll be attending upcoming workshops and in services with Off Leash K9 Training to continue to learn more to help my clients and their pups. There is a strong interest to add scent detection, tracking and agility to my resume.